You are here: Home / Kiloware pick of the day / Vanuatu Stamps Kiloware from a Fiji Seller! Vanuatu Stamps Kiloware from a Fiji Seller! Found on eBay is this nice Vanuatu kiloware. 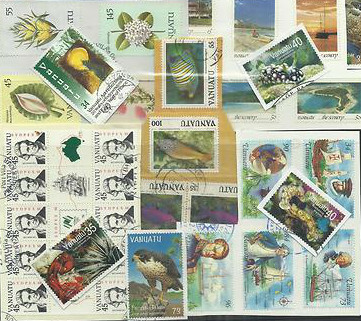 Technically not a kiloware, this is still a rather nice selection of on paper Vanuatu stamps. These are not that easy to come by, so if you collect small islands it might be of interest to you. From the seller pictures, it seems to be a rather good selection (might even be some complete sets?). Oh and guess what? Seller is in FIJi so you may expect a few recent Fiji stamps on your parcel as well. I almost wish I was collecting Vanuatu. I need to browse his inventory and see if there is anything for me in there. I love receiving beautiful package bearing nice stamps. Don’t you? Vanuatu was formerly known as New Hebrides (Nouvelles Hebrides). Is that a country you collect?